The documentary evidence below was available to all years ago. Some used it, what they could find of it. The entire NNP community always knew 9/11 was a nuclear event. They always knew nuclear weapons have been used continually as a handy solution that avoids the potential embarrassment of not having enough casualties or destruction during a state sponsored terror attack. Getting nuclear weapons is so easy we could be selling them here. We are beginning to enter new ground. We are now finding evidence that stolen Cold War era nuclear weapons slated for destruction were stripped down, remachined and built into enhanced radiation weapons of advanced design so they could be used with impunity, New York, Bali, intended for London, Iraq and Afghanistan, Damascus and more. Among the released information, the “leaks,” is key information regarding weapon design, more efficient fusion reactions and the ability to cover up nuclear terrorism through systematic disinformation campaigns through Hollywood that utterly misrepresent the endless capabilities and flexibility of nuclear demolitions. There are also reports of weather manipulation, two hurricanes, which helped dispel radiation that would have wiped out half of New York instead of simply killing the thousands who have died “mysteriously” of “toxic pixie dust” so far and the 70,000 reported by the New York Daily News as having cancers any idiot knows are radiation sickness. Again, with weather manipulation, we enter a new ground. VT has published on weather manipulation on several occasions, successfully predicting impossible storm behavior. We have seen typhoons blocked and hurricanes created and in one instance, the use of an energy weapon to stop a storm blasting a hole 30km into the earth’s surface causing a quake and nearly a tsunami. We will begin publishing these documents too if we have to. All of this is lied about, how weapons work, the effects, how they are considered and how many of them, virtually hundreds, have fallen into real terrorist hands, governments including the rogue elements of dozens of governments loosely or “not so loosely” controlled under the successors the SSG (Secret Shadow Government) has chosen to carry the mantle of its Gladio operations. Nuclear terror attacks are being planned today. We will see them in the United States. We have seen them before. No doctor will every diagnose nuclear weapons radiation poisoning. When Dr. Chris Busby did so in Iraq, his reports simply vanished from every place but Veterans Today. If necessary, we will bombard the public with evidence until something happens. We have anything and everything. Funny how you can do something that should matter so much and watch it touch no one. What we will do, at least, is end the blithering in the counter-terrorist communities and the various activist and truth movements. My text ends here. An apology to those whose work is included who shun publicity or are included through quotations in reports that have footnotes omitted. This is unintentional and unavoidable. Seismologists point out that Richter readings always come from Earth’s movements or explosives coupled to the ground, not from plane impacts on buildings or falling debris. Earthquakes rumble up to a climax and then decrease, but a sudden spike denotes a ground-planted explosive device. A look at charts in the endnotes from the Palisades station across the Hudson River shows sharp spikes of short duration, a hallmark for detecting any underground explosions whether from nearby quarry blasts or faraway nuclear testing. The nine-story WTC 5 suffered two gigantic holes that went straight through to the bottom-level basement. The hole in the eight-story WTC was 100 feet in diameter—and also dropped to the bottom basement. The nine-story WTC 4’s south wing was cleanly separated from the north wing which was flattened. Under the demolished wing was an equally large crater three stories deep. All the holes were strong indicators that explosions did hollow out basements for rubble. The slim 22-story WTC 3 (the Marriott hotel) had no holes, but WTC 2’s falling debris carved a “V” from roof to the third floor. “If the zinc was indeed a fission product, the device that produced it must have been specifically engineered to produce it: This device then produced mostly neutrons and enhanced radiation fallout with a relatively small blast in comparison with the mass of fissile material present. “We may well be looking at the signature of a very “advanced” nuclear device carefully set up to produce maximum radiation. Seismic evidence and witness statements indicate that high-yield explosives were used in basements of all buildings except the Marriott that morning to clear space for their remains. The Towers’ detonation and impact times were seconds apart, as Richter-scale data in the endnotes show. Basement Levels 1-6 to Floor 30 with doors blown off hinges, and two fire-blackened people dying in that lobby. It is difficult to believe that a hit between the 94th-98th floors was responsible for that kind of damage to the lobby unless the aircraft had dropped a bomb into elevator shafts. “There was elevator doors ajar. There were elevator doors missing. I could see an elevator car twisted in the shaft….there was a bunch of rubble on the floor…about three feet high in the middle. The ceiling wasn’t charred. So I had thought the floor blew up….I came to learn that that was bodies. We had to climb over and around this pile.” 50-ton exterior column beams flung upward from Towers basements to pierce buildings such as the Deutsche Bank across from WTC 2 (15th floor), the American Express (17th-19th) and Verizon buildings across from WTC 1’s two sides. 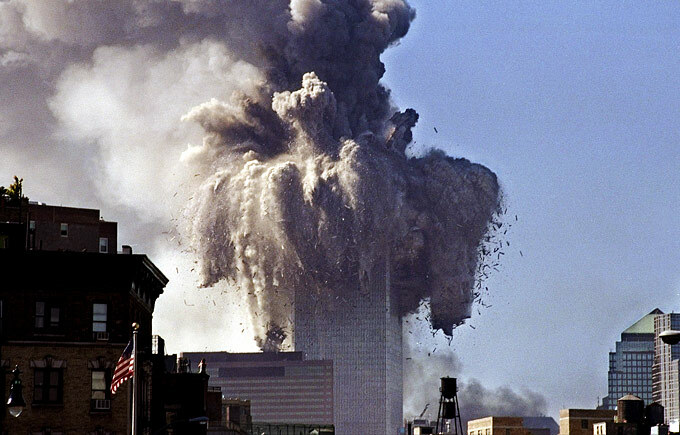 Timing between aircraft impacts and explosions had to be of the split-second variety to conceal basement detonations in the three skyscrapers. Seismographic data from the Palisade station across the Hudson River shows that seemed to have happened. Using the Towers’ central steel cores as a “chimney” for vaporizing them within 8 and 10 seconds. “…exploded violently and ejected pulverised concrete and rubble in all directions, followed by a pyroclastic flow of hot dust following the same pattern as the base surge of an underground nuclear explosion…. [An estimated 90,000 [tones of concrete in each tower was literally pulverised into dust, sand or grit-sized particles—an absolutely unprecedented event. In other words, the nuclear “event” began by the violent upward thrust of the nuclear blast 150 feet per second. Its white-hot heat shot upward vaporizing the Towers’ interiors of concrete, steel, glass, combustibles—and people—into dust. Blowing to the top and out into the atmosphere, the tremendous energy flung its steaming load of vaporized materials skyward to become multi-colored pyroclastic clouds of dust and radioactive fuel. But the eruption’s energy, like volcanic lava and pyroclastic flows, sped downward vaporizing the buildings’ exteriors. Only mountains of flying paper and corroded aluminum cladding escaped. Then, a natural phenomenon burst on the apocalyptic scene. A pair of hurricanes 300 miles off in the Atlantic Ocean—Erin (Class 3) boosted from the south by Gabrielle (tropical depression)—acted as vacuum cleaners to inhale the dust-packed clouds and exhale them off Greenland. It was a coincidence almost too extraordinary to be believed by some. They believe that weather manipulation has been achieved by the U.S. military. Military-directed hurricanes or not, the explosive events happening in Lower Manhattan made Erin’s Class 3 status largely unknown except for those in its path off East Bermuda and crews from the National Hurricane Center. Erin lingered only for 9/11 and then was buffeted east by the cool, cleansing winds from Canada and Gabrielle’s swift push north from the Gulf and Florida. The two storms thus prevented air stagnation over New York City that could have exposed millions to radiation. The scale of a subsequent cancer epidemic would have left no doubt about nuclear devices destroying the Center. Measurements of chemical and mineralogical elements in dust samples gathered in and around Ground Zero were initiated by the U.S. Geological Survey six days after 9/11. Its airborne team photographed the thermal hotspots. Both missions used state-of-the-art equipment and agency facilities. The ground team gathered samples during the evenings of September 17-18 from 35 sites in Lower Manhattan within a mile of the WTC’s circumference. Two were indoors samples, two from beams. Samples were taken from undisturbed places: window ledges, windshields, flower pots, and protected areas in entryways and stairs. Indoor samples came from a gymnasium and a 30th floor apartment. Tests revealed 42 elements. “…although quite variable, reflects the chemical contributions of materials used in building construction or found in buildings, such as glass fibers, concrete, gypsum wallboard, steel girders, wiring, ductwork, electronics, computers, paper, and many others. The particles of barium, zinc, and lead, elements that never should have turned up in Lower Manhattan, caught the instant attention of those who were knowledgeable about fallout. The elevated levels of nuclear particles omitted in the news release, but recorded in those tables: Uranium and its deadly offspring of strontium, barium, and zinc. Massive levels were found of strontium: 3,130 ppms as a maximum; 378 ppms as a minimum; and 726.61 ppms as the mean. In leaching tests, strontium’s minimum was a 561 ppms; the maximum, a staggering 1,690 ppms; a mean of 1,083.10 ppms. Other elements the USGS found were significantly rare for the area. “Indeed, any building with these concentrations of the highly toxic (and in this case radioactive) elements Strontium and Barium in its structure could never have been built because the construction crew would have become seriously ill first. “….The only explanation that is possible—and indeed the scientifically inescapable conclusion—is that a large-scale fission chain reaction took place in the locality, releasing Strontium, Barium and many other radionucleides into the environment as daughter products of Uranium fission….The presence of large quantities of other well-known daughter products in correlated quantities makes the case overwhelming, beyond any shadow of a doubt whatsoever that a nuclear explosion occurred. The presence of high levels of vanadium, a radioactive decay product. An expert in aerosols and atmospheric sciences, Dr. Thomas Cahill of the University of California, also had studied the USGS report and pronounced the vanadium level the highest ever seen in the U.S. So were the high levels of nickel and chromium, both decay products. During WTC cleanup. Beginning on October 3, vanadium levels increased day by day until October 26 when it was joined by a significant spike in chromium and nickel levels. Shock and Blast Waves fissionable energy is triggered into a chain-reaction. It is followed a nano-second later by a blast wave’s shock “front” of compressed air shutting out sound, and silently “blasting” everything in its path. As it strikes the ground, the super-heated wave roars along, flattening people and objects until its force is expended. It also can rupture and ignite gas and storage tanks. Traveling directly behind it, however, the blast wave extinguishes fires just as candlelight does when someone blows it out. Unfortunately, by then, the damage is done. If vehicles are parked close together—as they were in WTC garages and the neighborhood—one ruptured gas tank or gas leake on the ground can set off a chain-reaction of fires. That seems to have happened even to fire trucks and ambulances despite valiant efforts made by dozens of firefighting companies to extinguish them. Another sign of an underground nuclear explosion is a “base-surge” cloud that also travels along the ground. The dust contained in it on 9/11 was too cool and heavy to rise to thousands of feet and accompany the lighter and hot (500º-1,500º F) “pyroclastic” main cloud. The heavy “ejecta” from the fuel eruption falls to Earth and, still full of energy, is transformed into a dirt-and-air-filled cloud. It billows rapidly outward. On 9/11, the base surge carried particles of concrete, steel, office combustibles, asbestos, human remains, ash—and the radioactive materials revealed by USGS spectrometers. even Pacemakers. EMPs are a major concern for the military’s sophisticated communication systems as much as they were for First Responders on 9/11. They depended heavily on Handy-Talkies, especially for evacuation orders that were never heard by firefighters who died on the Towers’ upper floors. Another prime piece of evidence underpinning the nuclear theory is the extraordinary high temperatures (800-1,300º F) of the WTC’s surface heat after 9/11. It was recorded on September 16, 2001 by NASA’s thermal-sensitive cameras in aerial photographs shot at 6,500 feet. Those data were reflected in the unusually lengthy period—September 11 to December 19—it took for extinguishing the pools of molten metals in basement levels of all three skyscrapers. In fact, the hottest surface places recorded on the “Pile” by September 16 were WTC 1 (1,376º F), WTC 2 (1,1340º F), and WTC 7 (1160ºF). “… the rubble pile was so hot in places that it melted the soles of boots. Work shoes with steel reinforcements in the soles and toes protected feet against punctures by sharp objects, but often could not be worn because they conducted and retained the heat, causing blistered or scorched feet. One special-operations member said, “Steel toes never break in. We’d all be sitting there at night bandaging up and everybody had the same blisters. It was related to wearing the steel toe for that duration”. In two of the chief reactor accidents in history, that 2800ºF temperature was never attained. Windscale was 2,372ºF; Three-Mile Island was 2,012ºF. True, Chernobyl registered 4,172º F, but 14 days later dropped to 598ºF. The same rapid decline was reported for the other two other reactor disasters. At the WTC, thermal energy vaporized the rubble—concrete, steel, glass, combustibles—and emitted aerosols of chromium, nickel and other metals elements directly related to radioactivity. It was those “volcanic temperatures” and the constant simmering pools of molten metal that could not be hidden from the public. Neither could daily changes of soil, nor hosing down the embers. These are well-known remedies for extinguishing fission’s chain reactions until their energy is expended and decay begins. “The thermal energy available from the fuel on board each aircraft is minuscule in comparison with that required to melt the steel columns and raise the temperature of the rubble to the temperatures of 1000K [1,832ºF] recorded by the AVIRIS infra-red system at the surface, let alone the underground temperatures that were vapourising glass. The blue glow at that Soviet complex remained for two weeks until core fissioning ended and decay of nuclear remains began. If the exposed core in the Chernobyl accident could emit it, so could the Towers. When much of the debris field was cleared away by mid-March, a light concrete cover was poured over the WTC 1 and 2 sites. The city then placed two banks of 44 light blue spotlights atop them as a “Tribute in Light” memorial to the Towers. Lights were switched on at dusk until 11 p.m. from March 11 to April 13, 2002. This would only be temporary, the lights were extinguished almost a month later and trucked off to a Las Vegas warehouse. In order to cover up the blue light that would otherwise attract attention two light projectors were set up with the cover story of being a “Light Memorial”. They were used to shine up into the sky in the same place as the Cerenkov Radiation being emitted by ground zero. This was done in order mask it or at least provide a cover story to explain it. Perhaps it was an unrelated factor, but when Silverstein rebuilt WTC 7, one of its features was a seven-story, permanent “podium light wall” at its base. The wall has a seven-story ray of light that follows pedestrians walking past two sides of the building. Its color? Light-blue. Those base-surge clouds were deadly because the toxic dust penetrated bodies. So were the pyroclastic clouds that were not spirited away by Hurricanes Erin and Gabrielle their radioactive residue had to have settled for miles beyond the Greater New York area. What certainly is known is that millions have become affected physically either on 9/11 or in its aftermath—firefighters, rescue/recovery workers, residents, commuters—according to New York City’s health commissioner. Respiratory and lung ailments from Ground-Zero cleanup have received the most medical and media attention because of sheer numbers (22,416 in 2003 alone). Add to those figures the class-action suit of 8,500 recovery workers against New York City and the U.S. Environmental Protection Agency for lying about clean-air quality post-9/11 perhaps to protect the area’s economy. Like the 2,400 Pennsylvania families suing state and federal agencies concerning the Three Mile Island tragedy, they, too, face official denials about radiation deaths and ailments. Some 400 of the WTC litigants have developed cancer, considered highly significant by oncologists because of their relatively young ages and general good health prior to 9/11. Thirty-three died of cancer by 2006. Most foreboding of all, 75 of them have developed blood-cell cancers that could only be linked to radiation: non-Hodgkins lymphoma, multiple myeloma, thyroid cancer and myelogenous leukemia. Today, the unexpected, rapid growth of cases strongly indicates to health professionals that cancer may be the “third wave” of WTC-linked ailments and soon outnumber pulmonary deaths. Physicians increasingly are making comparisons to Hiroshima/Nagasaki blood cancers from the 1945 atom bomb attack and that same connection to victims of Three Mile Island and Chernobyl. A useful rule of thumb for gauging the proliferation of any given reactor is that 1 Megawatt-day (thermal energy release, not electricity output) of operation produces 1 gram of Plutonium in any reactor using 20% or lower Enriched Uranium. The number of nuclear weapons Israel produced depends on how much Plutonium has been produced at Dimona. The credibility of Vanunu‘s statement is essential in trying to assess Israel‘s nuclear capability. According to Mordechai Vanunu the Nuclear Reactor at Dimona was scaled up twice, the first was from 26 MW(t) to 70 MW(t), and the second just before he arrived at the facility was from 70 MW(t) to some higher level which produced 40 kg of Plutonium every year. This study assumes that the Dimona Reactor was operated at 150 MW(t) by 1977, which would result in producing 40 kg of Plutonium per year. From this the maximum and minimum yearly output of weapons-grade Plutonium fuel can be estimated, and the number of Plutonium based nuclear weapons that can be produced. (see Appendix). > First being that Dimona operated at a capacity of 26 MWt from 1963 until end of 1969, then from 1970 up to 1976 it operated at the upgraded capacity of 70 MWt. >Total Plutonium produced if the reactor was operating 60% of the time is 147 kg. > Total Plutonium produced if the reactor was operating 90% of the time is 224 kg. Second: Dimona continues to operate at Capacity of 70 Mega Waat from 1976 until 2008 i.e. no upgrade up to 150 MWt. * Total Plutonium produced if the reactor was operating 60% of the time is 627 kg. * Total Plutonium produced if the reactor was operating 90% of the time is 960 kg. Third : Dimona operates at Capacity of 150 MWt from 1976 until 2008, according to Mordecai Vanunu. – Total Plutonium produced if the reactor was operating 60% of the time is 1203 kg. – Total Plutonium produced if the reactor was operating 90% of the time is 1791 kg.